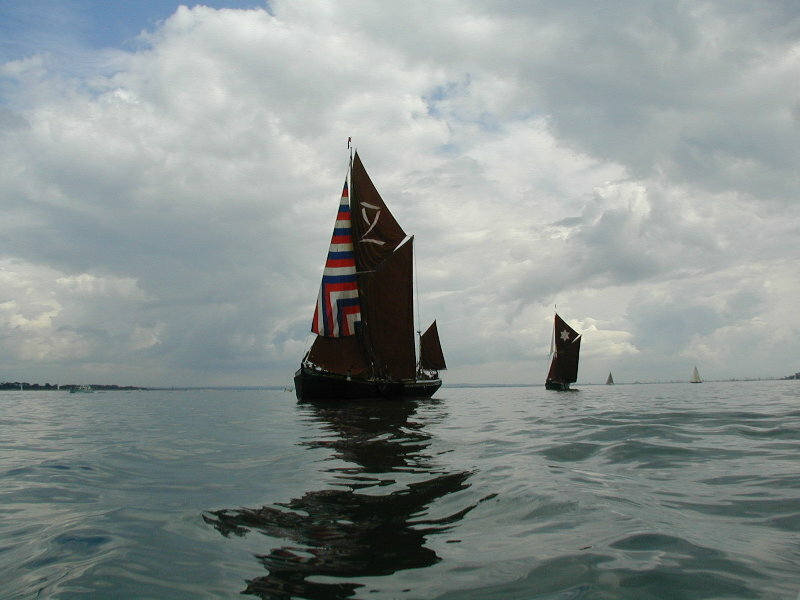 Barge matches date back to the late 1700s, even if their meetings were not known by that name then, but it took until 2000 for this particularly challenging form of sail racing to make an appearance within Skandia Cowes Week. This year’s event became a match race between Daphne (built 1923) and Kitty (built 1895) because a number of engine and weather problems kept other potential contenders away. But the pair still managed to show 870 other Cowes competitors a thing or two on Saturday by getting away on a very light breeze at 1000, three hours before the main classes commenced their starts. Starting these vessels in tide without wind requires an extremely conservative approach to avoid being over the line. Intent on reversing her fortunes this year after striking a yacht and retiring in 2002, Kitty quickly crossed the line within a minute or so of the gun and struck out on a tight reach for the first mark, Marsh, over on the eastern shore. Lady Daphne followed about six lengths behind. Both boats managed to keep their momentum despite the light breezes, no bad thing as you don’t restart over 80 tons of boat lightly. Gordon Diffey used to be a trading bargeman in the 1960s and crewed on Lady Daphne on Saturday. Despite his age, he was remarkable at showing the young, amateur crew what it really takes to sail these creatures. With such light winds, there was time for a few tales, including the race Gordon had won when the skipper had taken to his bunk due to sickness. Lady Daphne managed to keep nipping at Kitty, but Kitty kept her well covered. Just before the first rounding, Lady Daphne attempted to overtake. Kitty vigorously defended her position with an assertive luff, costing Lady Daphne a few lengths at the first rounding. Lady Daphne sought shallower waters by the shore to cheat the tide while Kitty took the direct line to the next mark, Royal Southern. As both boats came into the mark, neither strategy had paid off and Kitty held an almost identical lead. Things got very interesting at the Royal Southern rounding. Kitty misjudged a difficult tack in tide, hitting the mark. Her skipper, Wayne Norris, took the rounding mark penalty and then struck out for the island shore, apparently counting on winds freshening rapidly. Lady Daphne, skippered by James Kent, went north to Calshot to play with small tidal differences and gambling on the wind building slowly. The strongly diverging strategies led to over three miles of separation at one point. Both boats seemed to sail in and out of wind holes and pockets. The result? Lady Daphne stormed down from the north with increasing wind and tide to emerge some 12 minutes in front and tacked ‘nimbly’ (two minutes on a Thames barge!) across the finish line. The informal match chairman, Roger Marriott, hosted the prize-giving on Kitty, which he owns, returning the match cups to Lady Daphne. There have been a number of improvements to the Thames Sailing Barge racing at Cowes over the last four years to ensure that port-starboard incidents with yachts are minimised. The barge course is now separate from the smaller boats and the finish line has been moved away from the front of the Royal Yacht Squadron. These two changes have been strongly supported by the barge skippers and are likely to lead to quite a number of vessels returning to Cowes for 2004. There is also talk of introducing a handicap system that has been successful for a few years at the Thames Match. See http://www.thamesmatch.co.uk for more details.